On the 7th January 1944 174 ‘Mauritius’ Squadron were involved in operations over France. While attacking a site near Behen two aircraft, JP600 and JR373, collided whilst pulling out from a steep dive. 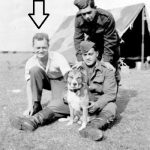 Flight Sergeant R.V Smith managed to bale out of his stricken Typhoon, becoming PoW however, Flying Officer John Frederick Cobbett was unable to escape. Both aircraft crashed in open ground near Toueffles. Alain Obée had been told of an allied aircraft crashing near the village of Toueffles, at the time the type was unknown although it was assumed to be a Spitfire. Together with Pierre Ben they decided to investigate the site further on the 28th December 2016. Using a magnetometer the precise location of the crash was located and it was arranged for Pierre’s friend, Etienne Boulnois, to dig the location on Saturday 31st December 2016. 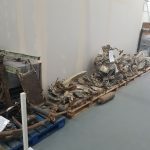 Large parts of an aircraft were quickly discovered, small radiator parts being found which suggested that this could still have been a Spitfire. However, a large amount of tubing was beginning to be recovered and with a very large undercarriage leg this was a definitely a different type. Unearthing a small plate inscribed with ‘Sabre’ and finally pieces of the rear fuselage with the serial JP600 positively identified this a Typhoon. 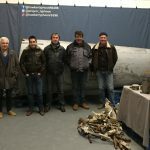 A huge number of parts from JP600 were donated to the Hawker Typhoon Preservation Group by Pierre Ben and will be an invaluable source for reverse engineering areas of the airframe where drawings do not exist. We thank Pierre and members of Somme Aviation 39-45 for supporting us in our task of restoring RB396, without help from dedicated groups such as this we would not be able contemplate this tribute to all the Typhoon crews. 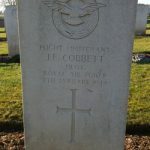 Pilot Officer John Frederick Cobbett was recovered from his crash site (at the time of the incident) and laid to rest in ABBEVILLE COMMUNAL CEMETERY, Plot 6, Row D, Grave 6.